Our flagship game, a free-to-play web-based MMORPG. We have been constantly refining and adding content to it for the past decade-plus. 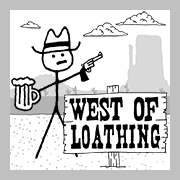 Available now on Steam (for Win/Mac/Linux) and the Nintendo Switch, WoL is an animated single-player adventure RPG set in the Wild West of the Loathing universe. Check out the Steam launch trailer, teaser trailer, and preview trailer, or maybe the Switch launch trailer! 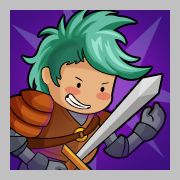 An educational roleplaying game full of dumb jokes enjoyable by all ages. Made in collaboration with Touch Press Games, available on iOS devices. Check out the trailer! A single-player role-playing-game where words are your weapons, and also your spells and stuff.